Spokane Valley is located close to the border of Idaho which borders six US states and one Canadian province (BC). It wasn't long after I left that I crossed into Idaho and began my trek east. After going west for so long it was a big change in context to now be heading east. I didn't get photo of the state sign because it came up so fast and it wasn't safe to stop. So instead I stopped in Wallace, Idaho for some gas. It is situated in the mountains and is a little town. There are lots of mines in Idaho and I came across this bit of history at a "viewpoint" along the highway. 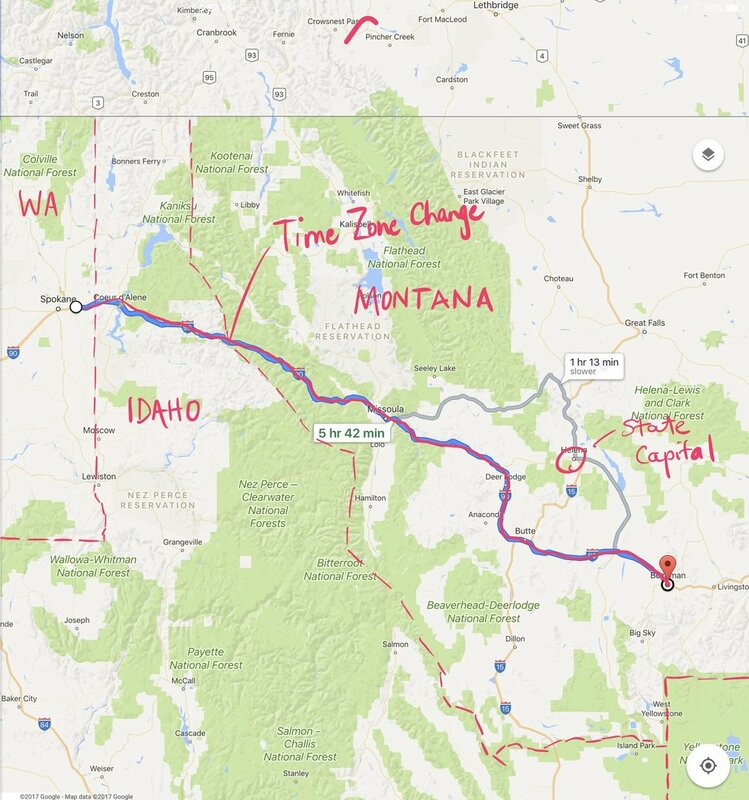 When I crossed into Montana I also crossed into the Mountain time zone and lost an hour. The border is roughly at this pine tree. I took this photo from the parking lot of a ski resort so the elevation was quite high. Montana border crossing from Idaho and time zone change. Montana was exactly as I had imagined. If you've seen the movie "A River Runs Through It", starring Brad Pitt then you will know what I mean. "The Maclean brothers, live a relatively idyllic life in rural Montana, spending much of their time fly fishing. The sons of a minister, the boys eventually part company when the older one moves east to attend college, leaving his rebellious brother to find trouble back home." The movie was narrated by Robert Redford. I love this movie and have seen it many times. Montana, in fact, does have a river running through it and Interstate Hwy 90 East followed the river. It was either on my right or left all the way to Bozeman. The railway also followed the river and I saw a long train with cars full of coal chugging along beside me. About 150 km into Montana I stopped at a rest area. The temperatures were again in the high 90's and I wanted to get out of the sun. I parked the bike in the shade and lay down on the grass under some trees. While looking up at the sky through the trees I contemplated the trip and drifted off for a short nap. It was bliss. I took a picture of this sign for posterity. You can see the clouds started forming in late afternoon as I headed east. Montana reminded me of Alberta with the mountains in the distance and riding across the flat plains fighting the wind. The highway follows the rails. Almost everyone drives a pick-up truck or SUV. It's rare to see a sedan on the highway. There are also a LOT of RV's being pulled by pick-up trucks and mobile homes pulling SUVs. I guess people like to travel with as much of their own stuff as possible. I arrived in Bozeman around 9pm and found a cool motel right downtown. As usual I got the 'last' room available. It was lucky it was a Thursday. The motel was booked solid over the weekend. I took advantage of being in the city centre and went out for a steak for dinner.